Have you ever thought how nice it would be to whip up a batch of homemade cinnamon rolls, but then didn't becaue it just plain took too long? After a little research I found a recipe for "real" cinnamon rolls without the two or more hours needed for rising time. This recipe uses a combination of yeast, baking powder and baking soda. That means lovely, yeasty, homemade cinnamon rolls in 45 minutes, from start to finish! Can I get a big Woo-hoo?!!! The original recipe comes from Melissa Zabel Yahoo! Contributor Network. Of course, I've eliminated the shortening and we're making these rolls with butter! There were no specific recipe amounts for making the cinnamon sugar and, I ended up using too much brown sugar in my original batch and my rolls were way too sweet! I have adjusted the amounts and your cinnamon rolls should be just right! 1/2 sugar (brown sugar optional) and 1 1/2 teaspoons cinnamon, stir to mix well. In a large mixing bowl, whisk together ~ flour, yeast, baking powder, baking soda, salt and sugar. Cut butter into the dry ingredients or work butter into flour using your fingers, until it resembles coarse crumbs. Stir in buttermilk. If you don't have buttermilk pour 1 tablespoon apple cider vinegar into liquid measuring cup and fill it with milk to make 1 cup total liquid; stir. Warm milk in microwave on half power for 60 to 90 seconds just til warm, not hot. This will help the milk to curdle. Pour buttermilk into your cinnamon roll dough, stirring until it sticks together. Turn dough out onto a floured surface and knead it about 20 strokes. 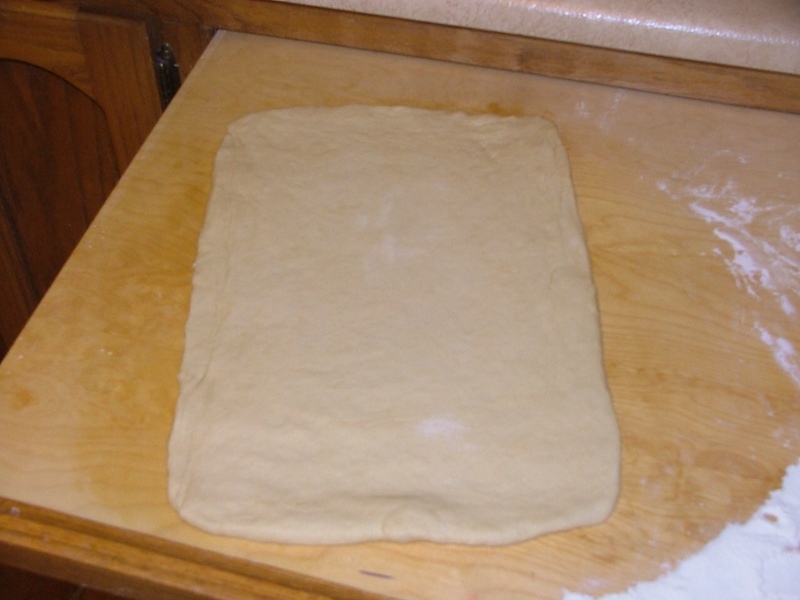 Roll dough into a rectangle measuring 14-inches x 10-inches x 1/4-inch thick. 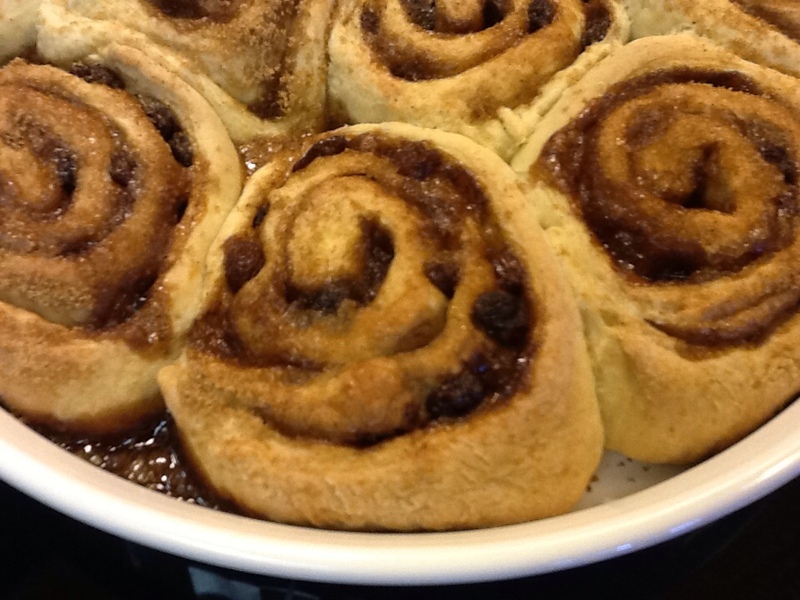 Sprinkle cinnamon sugar over the surface of dough leaving a 1-inch border without sugar. Sprinkle with raisins (optional) and dot with 2 tablespoons pinched off butter, see photo. Brush 1-inch sugar free end with water. 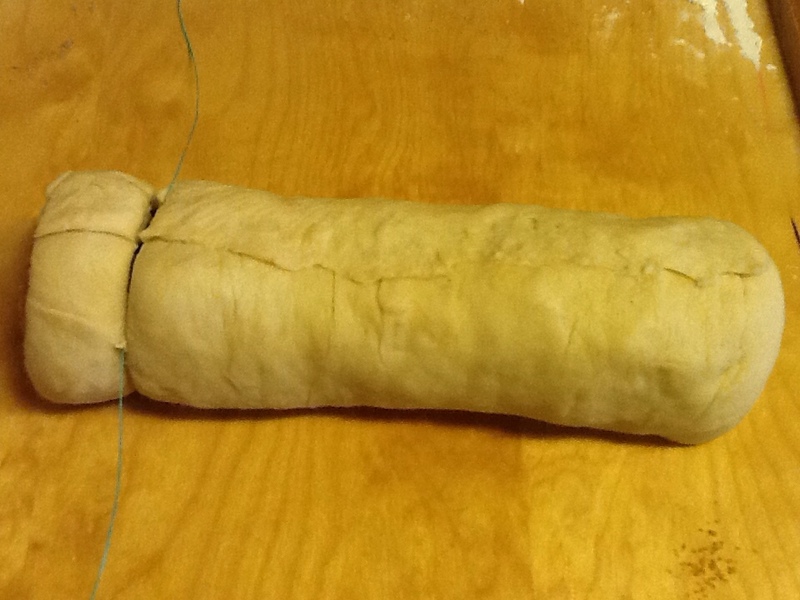 Beginning at the short side with cinnamon sugar, roll dough tightly to make a log. Press wet, sugar-free edge into log to seal. Slice into individual rolls. Place dental/embroidery floss under the log. Pull through dough crsss-crossing floss to cut into rolls. 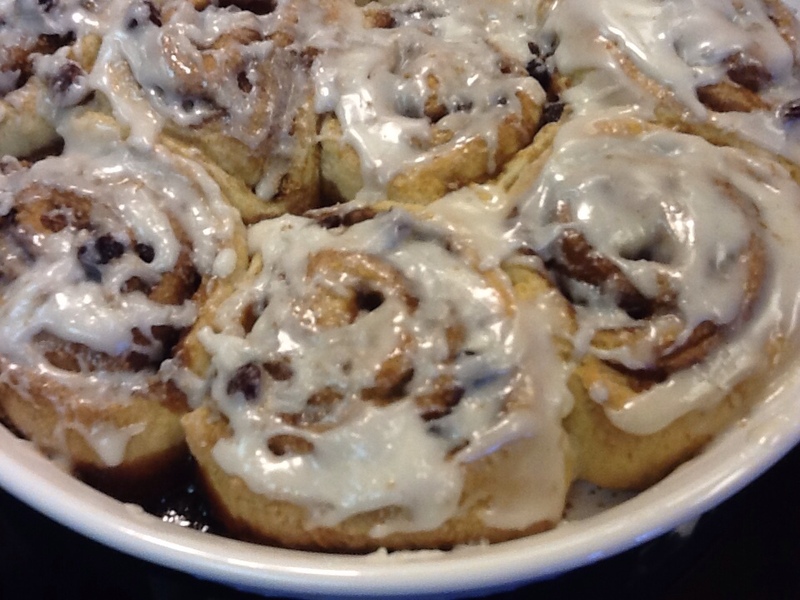 You should get 8 to 10 cinnamon rolls. Place them cut side down in a baking pan. I used a 10-inch torte pan. While rolls are baking, whisk up cream cheese frosting. 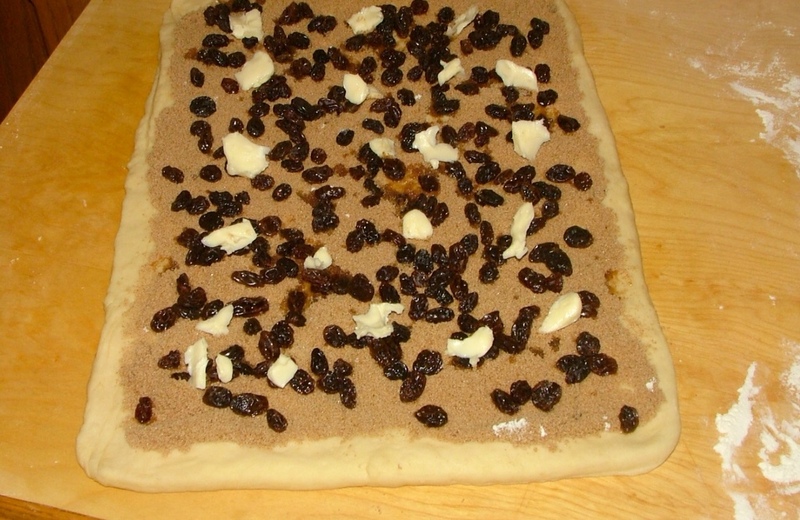 Cinnamon sugar dotted with butter and raisins. Cutting cinnamon rolls with dental floss ~ Criss-cross floss and pull! Out of the oven and ready for cream cheese frosting! Want to impress your husband this Father's Day? I don't know of a Papa alive, who wouldn't love being awakened to the sweet, yeasty smell of . 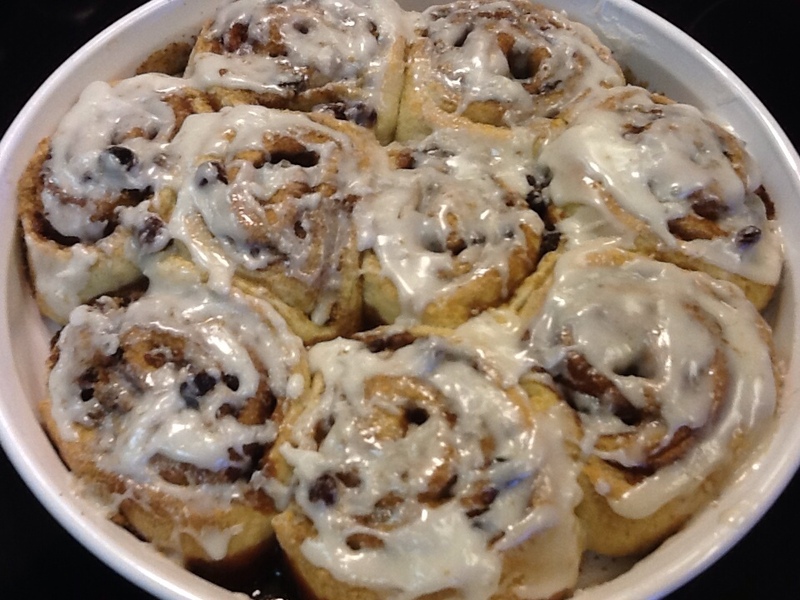 . . CINNAMON ROLLS! Women unite! Let's bless the socks off all the great Dads out there! Happy baking from Over at Julie's!!! BTW ~ This Sunday Will and I will be celebrating 40 years of marital bliss! Happy Anniversary Will!